Off to the Races - It's Derby Day! The Kentucky Derby has run continuously since 1875, even through the Great Depression. The land was acquired by Colonel Merriwether Lewis Clark, grandson of William Clark, of Lewis & Clark fame. The Kentucky Derby was always a fashion forward event. Men and women were expected to dress up in their finest. However it wasn't until the 1960's that the wearing of elaborate hats took off. 1938: The Mint Julep became the official drink of the Kentucky Derby. The reason for the silver cup? Rumor has it that jockey's were awarded sterling silver julep cups as a reward for first prize (and they look a bit like a trophy cup). Now that you know a little bit about the history of the Kentucky Derby, it's party time! Here we'll get the party started by sharing two great recipes. First, I'll share the recipe for the Mint Julep and here you can find an absolutely delicious Chocolate Bourbon cake recipe by Nathan Hubble, www.followthatfork.com. First things first... crushed ice. There are a few ways to approach this ingredient... first the crushed ice setting on your fridge, a blender or my favorite a Lewis bag and ice mallet. Why the Lewis bag & Mallet? The canvas Lewis bag actually wicks away extra moisture from the ice making a drier ice and therefore not watering down your drink from the get go. It also seems to produce a finer crushed ice than many of the blenders out there (no large chunks of ice mixed in with the fine ones). Not to mention it's oddly satisfying to smack ice with a hefty wooden mallet. Now it's time to make your mint julep! Add 1 oz Pope's mint syrup, 2 oz bourbon into your julep cup, at this point I'd give it a quick stir to incorporate the syrup and the bourbon. Add crush ice to the rim and stir again frosting the outside of the julep cup. Top with more ice creating a little dome. Give your mint a slap or two against your palm to release the oils (this adds to the drink by bringing the lovely aroma of mint right to your nose). Add the mint to your julep cup, don your fancy hat or smart bow tie (or cravat if you prefer) and cheer on your favorite horse! *We did say Derby party, right? Here are few quick tips to make life simpler, after all who wants to spend the whole time crushing ice and mixing mint juleps? The night before or morning of, crush lots of ice and store in in a ziploc bag in the freezer. The day of: wash and cut your mint sprigs for garnish, place them stems down in a cup of water to keep them fresh. In a large pitcher, pre-measure and mix the bourbon with the mint syrup, store in fridge until ready to use. When it's party time fill your julep cups with ice, pour bourbon & mint mixture over top, garnish with mint, serve and cheer on your favorite horse! Posted on May 6, 2017 by Marie Teckmyer and filed under bourbon Cocktails, happy hour collection, cocktail recipes and tagged kentucky derby mint julep recipe silver julep cup mint syrup lewis bag and mallet love anji paper flowers red roses barware bar tools bourbon cake chocolate bourbon cake followthatfork food stylist food photographer Kentucky derby recipes derby party. Let's celebrate with Bacon, Bourbon and Popcorn! In honor of National Bacon Day, Nathan Hubble from Follow That Fork and Happy Hour Collection have partnered up to share a couple of sweet & savory bacon and smoked maple recipes with you. Nathan popped into Happy Hour Collection several months ago and purchased Hella Bitters Smoked Chili Bitters to use in a recipe he was developing. Instead of using bitters in a cocktail recipe, Nathan created a mouthwatering recipe for Smoked Chili Chocolate Ice cream. It sounds amazing doesn't it? If you think it sounds good, you need to check out the photo he took... it'll make you want to run out and buy smoked chili bitters. Check out his recipe and photos by clicking www.FollowThatFork.com While you're there, be sure to check out his other recipes and sign up to be on his email list. Since then, Nathan has created more recipes and stunning photos with some of the products from Happy Hour Collection. One of my favorite parts about this collaboration is that Nathan looks at the products and finds ways to incorporate them into main courses, snacks, desserts and occasionally cocktails. I focus mainly on the cocktails and techniques. We will both be sharing more photos and recipes with you in the future and I can't wait! Who doesn't love bacon?! If it's you, look the other way. Nathan and I both used bacon and Barrel Smoked Maple Syrup in our recipes. First up, Nathan's created a great recipe using bacon, Tippleman's Bourbon Barrel Smoked Maple Syrup and popcorn. I share the recipe here but check out Follow That Fork for variations and other recipes. Preheat oven to 225 degrees. In a large glass bowl*, stir together popcorn, bacon and peanuts. Melt the butter in a saucepan, add the smoked maple syrup and salt. Using a candy thermometer bring the temp up to 240 degrees, then add baking soda. The mixture will bubble up. Carefully pour the hot candy mixture over the popcorn and stir to evenly coat. Spread into a flat layer on a baking sheet lined with parchment paper (if you don't have parchment paper- butter the bottom of the pan before spreading the popcorn mixture) and bake for 1 hour, stirring every 15 minutes. Take out the oven and let cool. Store in an Airtight container. *remember the hot candied liquid is molten! Be sure to use a glass bowl or large metal pot when mixing together the popcorn mixture with the hot candy mixture. Remember that bacon you cooked up? of course you do you most likely snagged a piece or two before serving it up. This next recipe is actually two recipes and includes a technique known as fat washing. I admit that Fat washing doesn't sound appealing, at all. "What are you doing today?" "Oh, I'm fat washing my bourbon." "????" So here goes, fat washing is a technique used to impart the flavor of different fats or oils into your spirit of choice. Still not convinced? How about peanut butter fat washed vodka with chocolate liqueur for a Chocolate peanut butter martini, or maybe peanut butter bourbon in a blackberry smash (peanut butter & Jelly). Rum infused with butter or coconut oil or for the more adventurous how about pork fat in mezcal. There are many innovative recipes out there using the fat washing technique. Have fun creating! For now here is an easy and tasty cocktail using bourbon, bacon and barrel smoked maple syrup. Cook up your bacon for the Smoked Maple Bacon Popcorn and reserve the bacon grease. Let's get started. First pour your bourbon into the glass container, then pour bacon grease through a fine mesh strainer into the bourbon. Put your lid on and shake for about 20 seconds. Let sit on counter for about 4 hours. Place in freezer overnight. In the morning scoop out the bacon fat and run the bacon infused bourbon through a mesh strainer, cheesecloth or coffee filter. Voila it's as simple as that! The bourbon takes on a smokey mild bacon flavor. See Below for Smoked Maple Bacon Old Fashioned recipe. Now that you've bacon washed your bourbon, you're ready to start experimenting with smokey bacon bourbon. Add ice ball to rocks glass. In mixing glass filled with ice, add bacon bourbon, Tippleman's barrel smoked maple syrup, Full Measure aromatic bitters. Stir until well mixed, about 25 seconds. 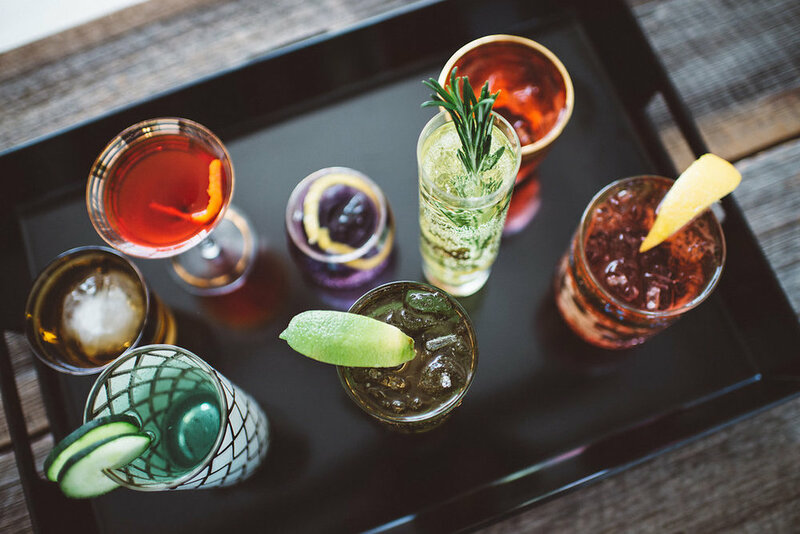 Strain and pour into your rocks glass, garnish and enjoy! Hopefully you've enjoyed our collaborative blog post. Make sure to subscribe to Nathan's blog, Follow That Fork, for more cocktail and non-cocktail recipes. You'll be seeing a lot more from both of us in the future. Posted on September 3, 2016 by Marie Teckmyer and filed under bourbon Cocktails and tagged bourbon cocktail bacon bourbon bacon bacon oldfashioned maple old fashioned fat washing bacon infused bourbon bourbon recipes tippleman's smoked maple syrup full measure bitters Ft washed cocktails follow that fork food stylist tippleman's barrel smoked maple syrup full measure bitters bacon old fashioned maple bacon popcorn happy hour collection happy hour cleveland.